Presoaking is executed immediately following a surgical procedure as the first step of instrument cleaning. Typically enzymatic detergents are used to break down organic material and presoaking makes later processing easier by helping to prevent blood and other matter from drying on instruments. There are many varieties of pre-soak solutions which are safe for cleaning fiber-optic instruments like endoscopes and cystoscopes. Presoak detergents come in 2 main varieties: dual-enzymatic & single-enzymatic. 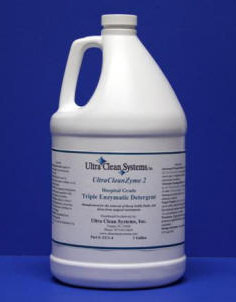 Dual-enzymatic detergents have a dual-enzyme formula that breaks down protein deposits, starch, and carbohydrates that accumulate on the instruments. Single-enzymatic detergents have a single-enzyme formula that cleans proteins. Detergents are available via liquid or dry tablets.